We were not quite sure what to make of this phishing email that landed ungracefully in our spam email nets today. It does use the subject line of “ANZ Security Alert” but it is a phishing email. This particular phish did not appear in the numbers that usually indicate a phishing campaign. It also appears the crafters of the email didn’t look too closely at the finished product. Given the low numbers we detected, we suspect this is the work of an individual, rather than a group. In any case, Figure A shows the email in question. Rather than use the old fashioned greeting, the email jumps straight into a short spiel on conditions of use. Actually, the email is literally all over the pace. Figure A is exactly how it would appear if it landed in your Inbox. 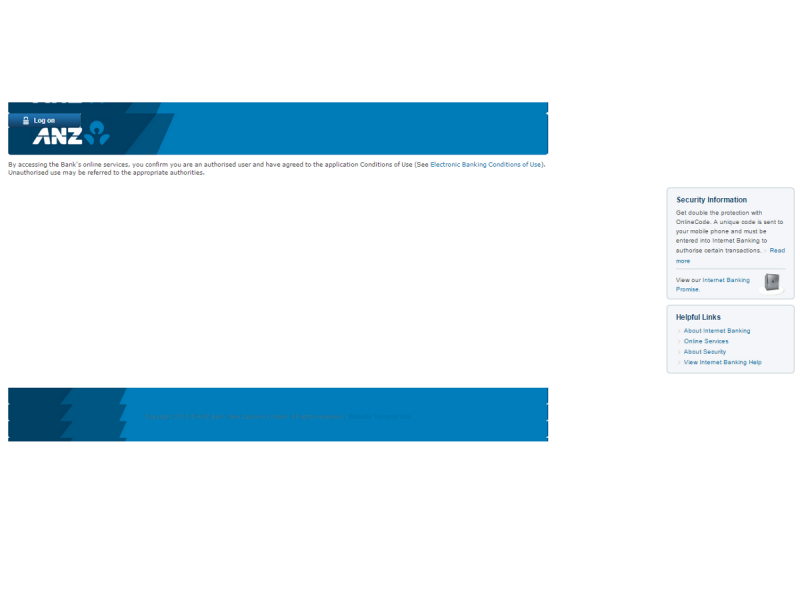 There is a realistic looking ANZ logo in the top half of the email, and another rectangular box with the ANZ colours at the foot of the email. There is a copyright notice inscribed in the bottom box. It is very hard to read on account of the colours used. On the right hand side two boxes are shown, one called “Security Information” and one called “Helpful Links”. There are actually no links contained in either of these boxes. The sole link contained in the email is in the top right hand corner of the email. The button has the text “Log on”. The subject line of the email is “ANZ SECURITY ALERT”. The sender of the email is “ANZ ANZ ALERT”. This email is a slightly disjointed effort. It is a fake, of course. It does tend to give itself away. Leaving that aside, the lack of a personalised greeting is another sign that this is fake. Finally, mousing over the sole link in the email shows that it leads to a phishing site. Not to the genuine ANZ site. Delete this email if you receive it.